RIYADH, Saudi Arabia -- President Donald Trump, in the first stop of his maiden trip abroad, received a regal welcome Saturday in Saudi Arabia, feted by the wealthy kingdom as he aims to forge strong alliances to combat terrorism while pushing past the multiple controversies threatening to engulf his young administration. Trump arrived in Riyadh after an overnight flight and was welcomed at elaborate airport ceremony punctuated by a military flyover and a handshake from Saudi King Salman. He is the only American president to make Saudi Arabia, or any majority Muslim country, his first stop overseas - a choice designed in part to show respect to the region after more than a year of Trump's harsh anti-Muslim campaign rhetoric. Trump waved from the doorway after Air Force One touched down and before descending the staircase with first lady Melania Trump. The 81-year-old King Salman, who used a cane for support, was brought to the steps of the plane in a golf cart. The leaders exchanged pleasantries and Trump said it was "a great honor" to be there. Soon after, Trump tweeted for the first time on international soil as president. "Great to be in Riyadh, Saudi Arabia. Looking forward to the afternoon and evening ahead." White House officials hope the trip, complete with images of the accompanying pomp and pageantry of a president abroad, will help Trump recalibrate after one of the most difficult stretches of his young presidency. The White House bungled the president's stunning firing of FBI Director James Comey, who was overseeing a federal investigation into possible ties between Trump's campaign and Russia. This week, the Justice Department relented to pressure from Democrats and named former FBI chief Robert Mueller as special counsel to lead the probe. The New York Times reported that Trump called Comey "a real nut job" while discussing the ongoing investigation with two Russian officials in the Oval Office earlier this month. He also told them that firing Comey had "taken off" the "great pressure" he was feeling from the investigation, the Times reported. Meanwhile, The Washington Post reported that an unidentified senior Trump adviser was being considered a "person of interest" in the investigation. Separately, Comey agreed to testify at an upcoming, open hearing of the Senate intelligence committee, the panel said. 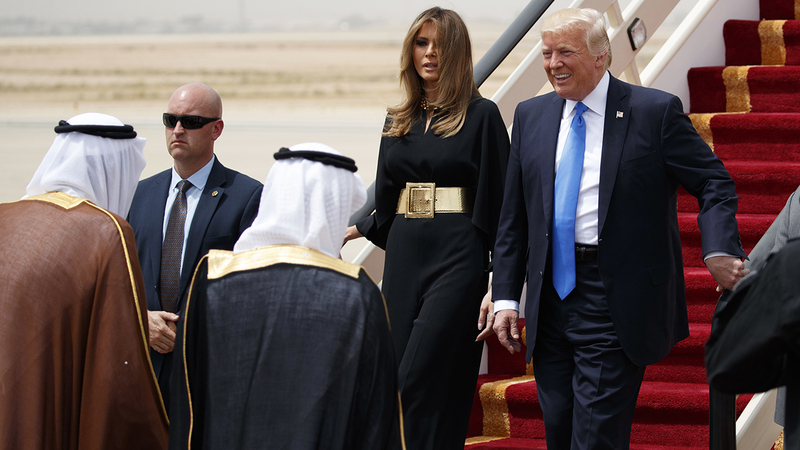 Despite those troubles, Trump was warmly received in Saudi Arabia in contrast to his predecessor. Saudi's ruling family grew deeply frustrated with Obama's detente with Iran and his restrained approach on Syria. The king did not greet Obama at the airport when he visited last year. Trump arrived as Iran's President Hassan Rouhani won re-election by a wide margin, giving the moderate cleric a second, four-year term to continue pushing for greater freedoms and outreach to the wider world. For a president who campaigned on an "America First" platform, the trip is a crucial moment for U.S. allies to size up Trump's commitment to decades-long partnerships while trying to move behind his previous controversial statements. After spending much of Saturday meeting with King Salman and other royal family members, Trump was ending the day at a banquet dinner at the Murabba Palace. On Sunday, he'll hold meetings with more than 50 Arab and Muslim leaders converging on Riyadh for a regional summit focused largely on combating the Islamic State and other extremist groups. The centerpiece of Trump's visit to Saudi Arabia is a speech Sunday at the Arab-Islamic-American summit. White House aides view the address as a counter to Obama's 2009 speech to the Muslim world, which Trump criticized as too apologetic for U.S. actions in the region. Trump will call for unity in the fight against radicalism in the Muslim world, casting the challenge as a "battle between good and evil" and urging Arab leaders to "drive out the terrorists from your places of worship," according to a draft of the speech obtained by The Associated Press. The draft notably refrains from mentioning democracy and human rights - topics Arab leaders often view as U.S. moralizing - in favor of the more limited goals of peace and stability.